As a child I always loved picture books. I would listen to the story or read them, but I liked to create my own stories out of the illustrations. I looked at the illustrations again and again and carefully find the details in the paintings. Those details made a huge difference in the story. It was a joy to discover a little detail each time I looked at the illustrations. Now that I have grown up, I still like to look at illustrations and works of art carefully. I know that every time I will find something new. 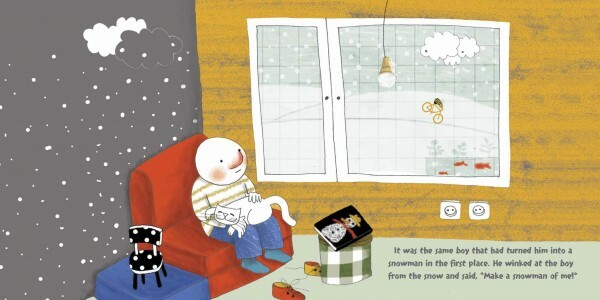 Other than the snowman and the boy, there is a bee, a cat, a bike, and an ice-cream in every page. 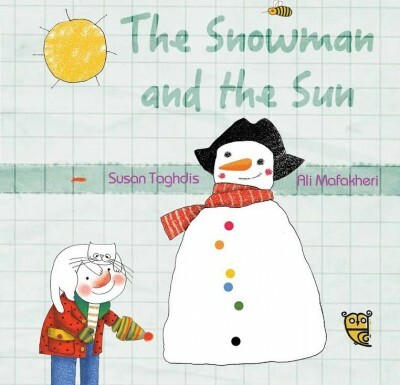 The state of the ice-cream changes as the story of the snowman progresses. The snowman has three blue buttons when we first see it. On the last page when the boy makes the snowman again though, the buttons are more and in more colours. When the snowman melts and evaporates, we can still see its buttons in the water and the clouds. All these details add to the beauty of the book. Can your child find these details in the book?